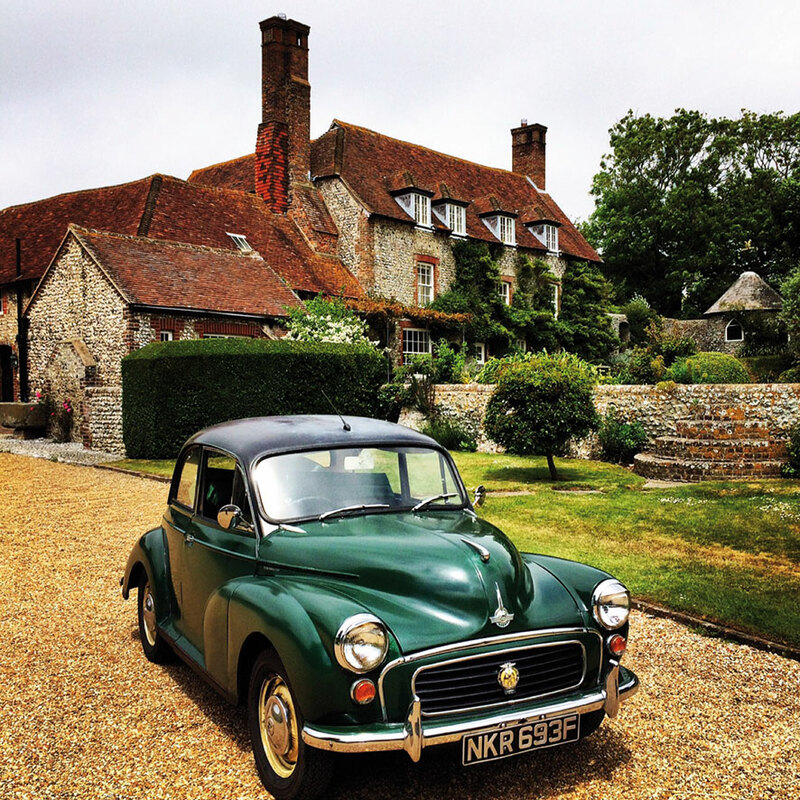 Some readers might remember that in an earlier edition of In Retrospect I wrote about purchasing my first classic car, Aubrey, a 1968 British Racing Green Morris Minor. Well buying that car last spring turned out to be more of an adventure than we thought it was ever going to be. Now, we got lucky, as unlike many Classic British cars Aubrey was mainly structurally and mechanically sound. However there were a few things we wanted to attend to like upgrading the electrics, re-spraying some of the paintwork and some minor welding to the floor pan. Here is how we did it. Now as with any motor vehicle there is always a lot of teeth sucking and ‘It’s going to cost you’ whenever you look to get work done. In order to finance some of these works we thought about doing a sideline in wedding car hire. However this would have been a great idea if we’d had the foresight to have purchased a four door, no bride I know would relish the idea of clambering ungraciously out of the passenger seat of an old moggy whilst clad in a spotless dress. We stumbled on our business idea when my hubby said one day that he thought the peculiarly idiosyncratic parcel shelf would make a great pull out bar, bingo! 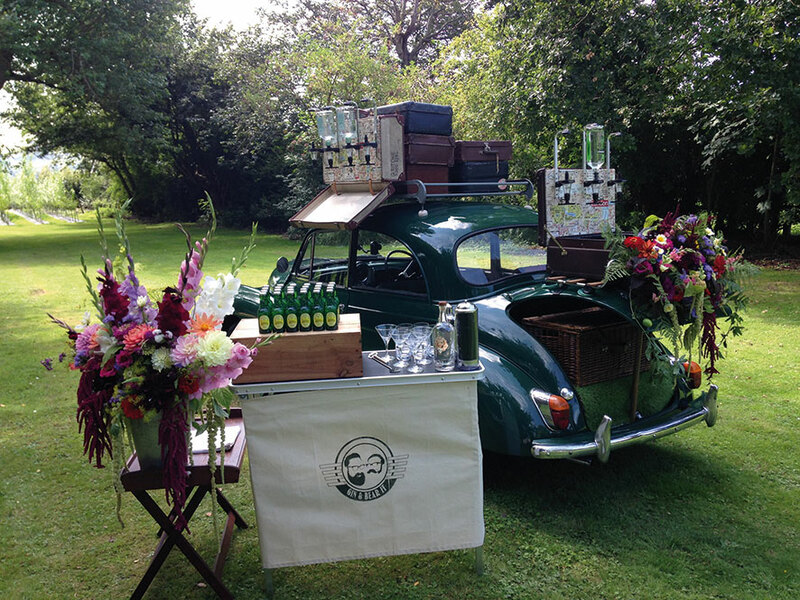 Our dedication to and love of our moggy doesn’t stretch to that very outdated habit of drinking and driving, but we did think the idea of a mobile bar could be a winner and as we both love gin we decided this would be the perfect route. Gin and Bear It was born. For anyone starting a new business market research is key. Is your business actually needed? So rather than take extensive surveys of people to see whether there was a need for a retrospective mobile gin bar we decided, as you do, to head straight to our local hostelry. This may sound like the musing of an alcoholic however there was method to this idea. As we had decided that gin would be our specialty we only thought it right that we try Brighton Gin for the first time and we knew that our local pub The Urchin stocked it.
. I walked up to the bar and ordered two large Brighton Gin and Tonics, and got chatting to the barman about just how lovely a drink it was. He told me that one of the founders of Brighton Gin Kathy Caton, was sat just opposite. This opportunity was too good to miss, I marched right up to poor Kathy and introduced myself and our business. Kathy seemed bemused and somewhat intrigued which was lucky as other than a car and an idea we didn’t really have a business at that time. We swapped details and arranged to meet with her business partner Helen Cheshire a couple of weeks later. In the mean time we cracked on. The first thing I had to do was apply for my personal alcohol license, this took a little bit of time as you have to do a short qualification before applying. Then insurance came next (but that’s so dull I shan’t trouble you with it), shortly followed by our website and social media. Just a quick tip with the website and social media, make sure you buy all URLS that have your business name in them, if you can, this prevents confusion with your businesses or businesses trying to half inch your identity. We have also begun the process of registering the Gin and Bear It name as a trademark, which is easier than you’d imagine but it does cost a couple of hundred pounds and can take some time. Now I’d say social media for a small local business is key. My tips here would be make sure your brand identity is strong. We had a designer friend whip up our logo, which not that we’re narcissists (the Morris’s mirrors are far too small and scripted to spend too much time admiring yourself in) are our faces inside the Morris badge. Our brand (or perhaps my moustache) is so strong that I have had strangers enquire after our car in the street, who follow our Twitter feed. Our business is restricted to Sussex, Surrey and Kent for no other reason than as much as we love the old beast, Aubrey can struggle on longer journeys and we’d never want to let anyone down. With this in mind we set about following other local businesses who were relevant to what we were doing. Also having local suppliers like Brighton Gin on board is great for brand identity and to some extent novelty. Make your social media content relevant and fun. We keep abreast of developments with other local business and national stories that relate directly to what we do, we also write blogs on gin and cocktails to keep our content fresh. Don’t underestimate the importance of this or the amount of time this takes, it is exhausting and rewarding in equal measure but when you’re starting up it’s a great way of getting your name and face out there with very little outlay. Our first couple of gigs were done at cost price as they were as much for our benefit, as they were for the people who had booked us. These were really instructive, as I mentioned earlier our initial idea was to serve from the rear of the car however during our first gig after we’d set up we realised that if we had a roof rack with optics attached we’d be able to offer a great range of alcohol and it would also look massively cool! We asked a carpenter friend to make us a rig using reinforced suitcases attached to an original roof rack I’d managed to snap up on eBay and it looks amazing. We’re still very much on a journey with our little old fashioned business and it’s one that we’re hoping will lead to profit. Yes that’s right folks I am sorry to say if you’re hoping to retire within months of starting a new business then it’s probably not going to happen. Our business has taken a lot of outlay however we are projecting we will start turning a profit before the end of the second year of trading. Get business advice, your bank will provide this free of charge when you open your account and help you get the financial projections right. Also make sure you speak to an accountant as those pesky chaps from the Ministry of Rinsing You for Cash will want their slice of the pie in the end. There’s no point pouring your heart and soul into something unless you really want to make a go of it, or if it’s going to end up eating your life savings. Make sure that your business stands out and that there’s a definite need for it. Look for opportunities as they wont find you. We have done lots of cost gigs as they’re a great way of getting profile for your business and promoting what you do and also learning what you need to do or change to perfect your offering. We’ve only been going for eight months but already the calendar for 2016 is looking packed with weddings and festivals. Be brave and take the advice of others. Meeting with Kathy and Helen of Brighton Gin was invaluable, not only were they fabulous but they freely gave their advice to us as fledgling entrepreneurs, however none of that would have happened if I hadn’t have marched up to Kathy that day, and we’ve also made a couple of lovely new friends. I also believe your local Chamber of Commerce can be a great source of advice from other small businesses, we’ve not joined ours yet but it’s on our to-do list for 2016. 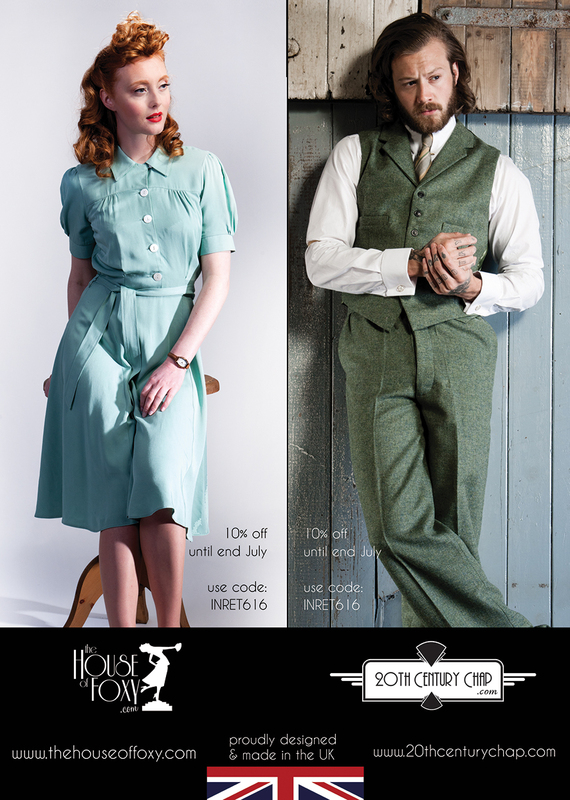 The great thing about our business is it combines all of our main loves: dressing well, classic motoring and gin! It’s true when they say if you love what you do then it doesn’t feel like work and this has been nothing but fun so far. If you have an innovative retrospective business and would like to be featured in a future article we’d love to hear from you. Get in touch via editorial@inretrospectmagazine.com. 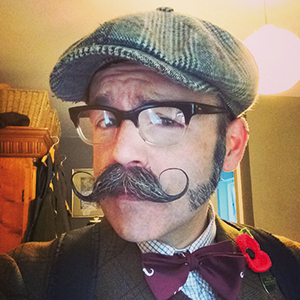 Mr Burns is a proud member of The Handlebar Club and occasional Oxfam blogger. When not twirling his moustache like a Victorian villain he can be found lurking in charity shops sniffing out vintage bargains. For half witticisms on Twitter or to peep into his life on Instagram, look up @supernoodle76.